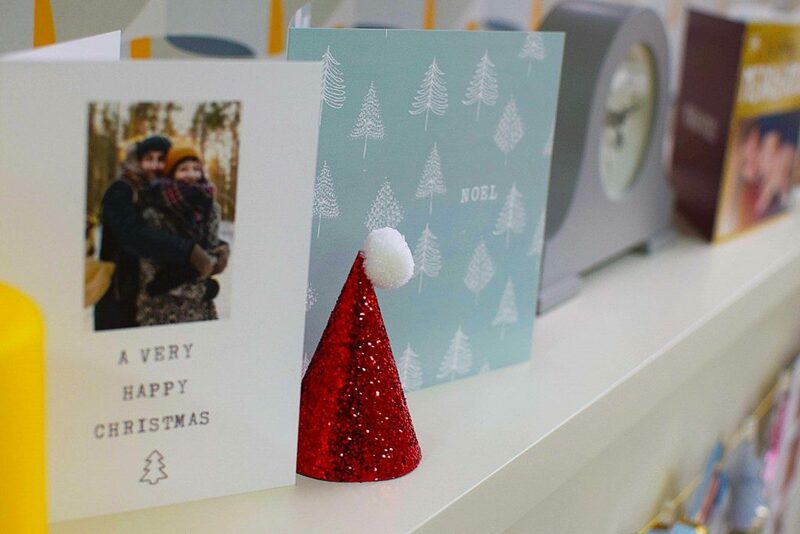 Here at Photobox, we’re partial to a sending a Christmas card or two. In this age of social media, we think it’s nice to take the time to create your own Christmas card and write a message to let your loved ones know you’re thinking about them at this time of year. 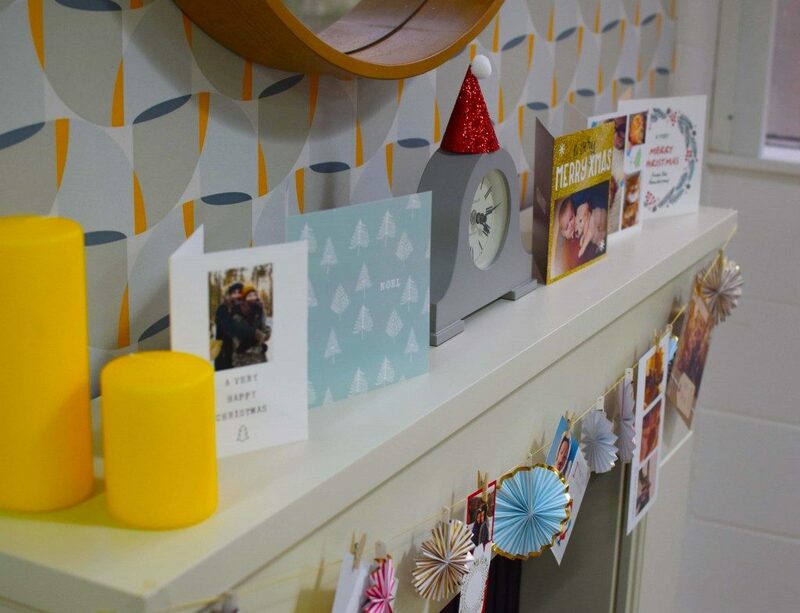 The mantelpiece is an obvious go-to for displaying your cards, but since we have flat ‘postcard’ style cards as well, we wanted somewhere to show these off. 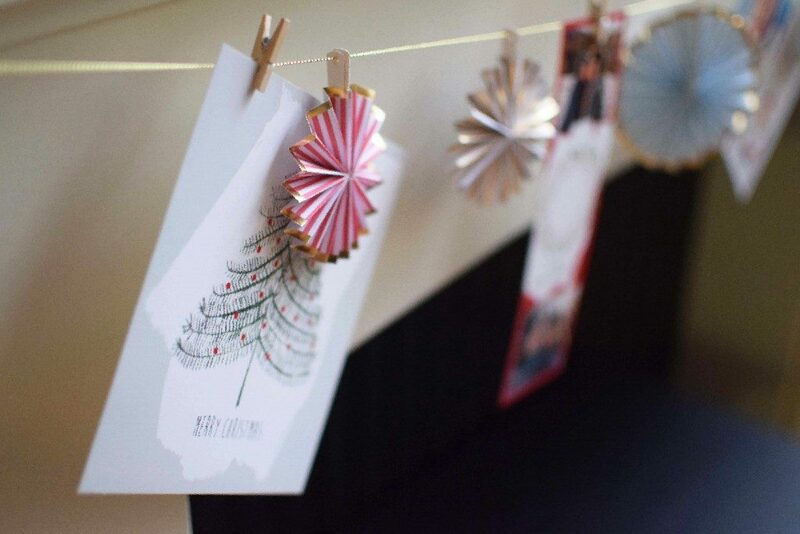 Under the mantelpiece and our traditional ‘folded’ cards, we added this festive mini pin wheel garland from Party Pieces, and used mini pegs to attach the cards on. 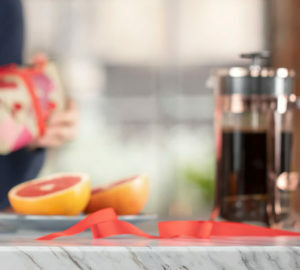 You could also try clipping your cards to some twine, ribbon, or even sparkly tinsel – it is Christmas after all! If you don’t have a mantelpiece, never fear – you can always use a shelf or arrange the cards on top of the cupboard. 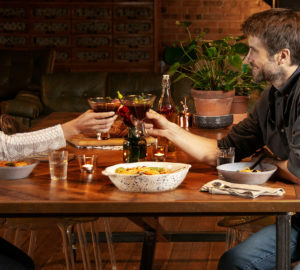 With Christmas decorations, presents and the obligatory bowl of Roses (or Quality Streets, if you’re that way inclined) all fighting for surface space during the festive period, we’ve quite literally gone up the wall with this idea. 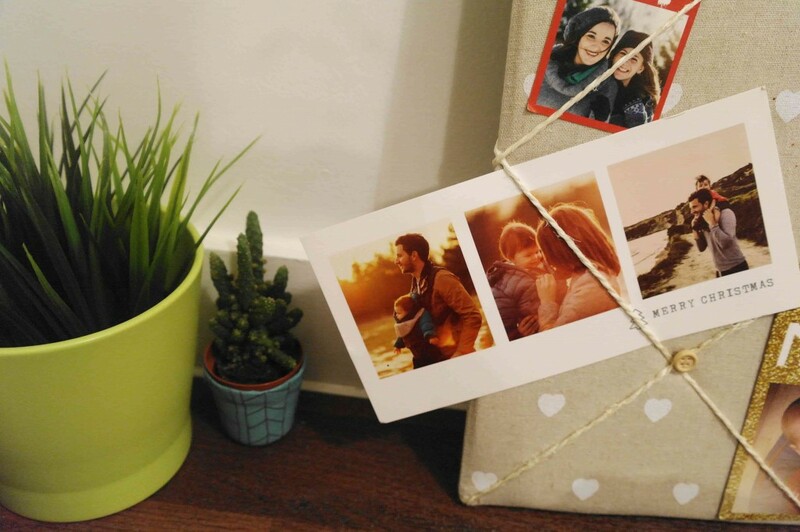 You can display your cards in this way on a blank wall, the back of a door, or even in your front window – all you need to do is measure out several lengths of string and secure to your chosen surface using washi tape. You can choose to hang the string vertically or horizontally – it’s completely up to you! 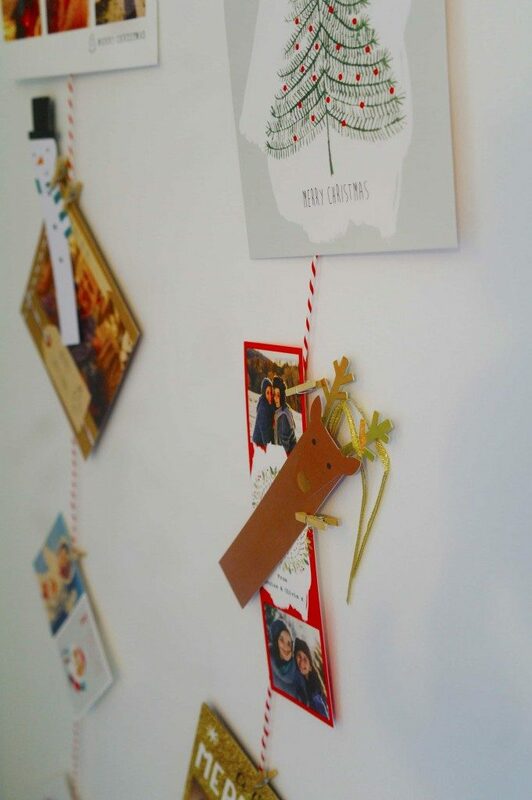 Using small craft pegs, attach your cards at random intervals along the string. We’ve used some festive accessories from Party Pieces to add to our display. Top tip: You could use a string of fairy lights as an alternative to string or twine for a real touch of Christmas. 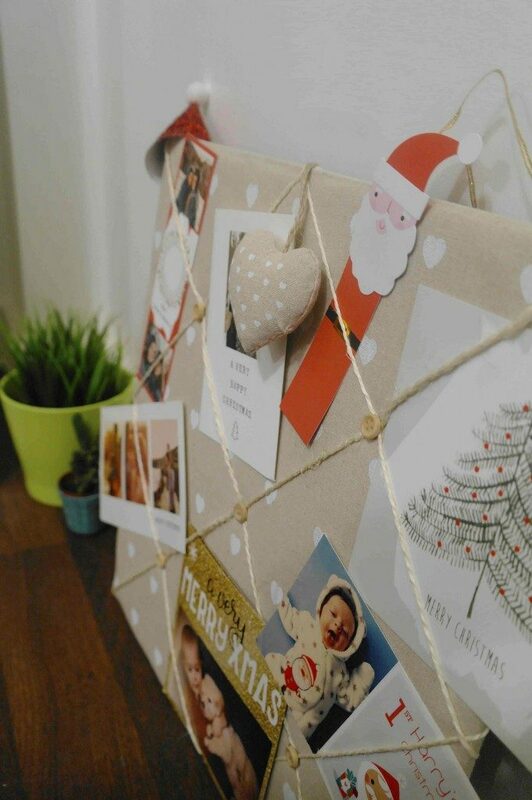 Our third and final display idea involves an item that you might already have lying around the house – a trusty cork board. 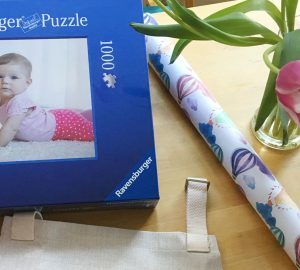 We covered our corkboard in a neutral material to start with, and then decided on a pattern to arrange our string – we chose a cris-cross pattern so we could fit in as many cards as possible. Secure your string to the board using pins or nails. We then glued buttons onto the top of each pin, to give it a more finished look. Now, time to display your cards! Simply slip between the two layers of string, or attach using craft pegs.